The public is hereby informed that in response to issues raised by certain members of the Filipino Community in Pakistan, the Embassy has conducted a thorough assessment and verification of the status of the accreditation of Foreign Placement Agencies (FPA) operating in Pakistan, in consultation with the Philippine Overseas Employment Administration (POEA). This verification process commenced immediately after the consultation meeting called by the Philippine Embassy and attended by the eight (8) FPAs operating in Pakistan on 21 February 2018. As a consequence of this verification process, the Embassy has temporary halted the processing of No Objection Certificates (NOC) for applications that are not covered by the ban on direct hiring. The verification process was completed on 6 April 2018. Hence, the processing of NOCs will resume on Tuesday, 10 April 2018. 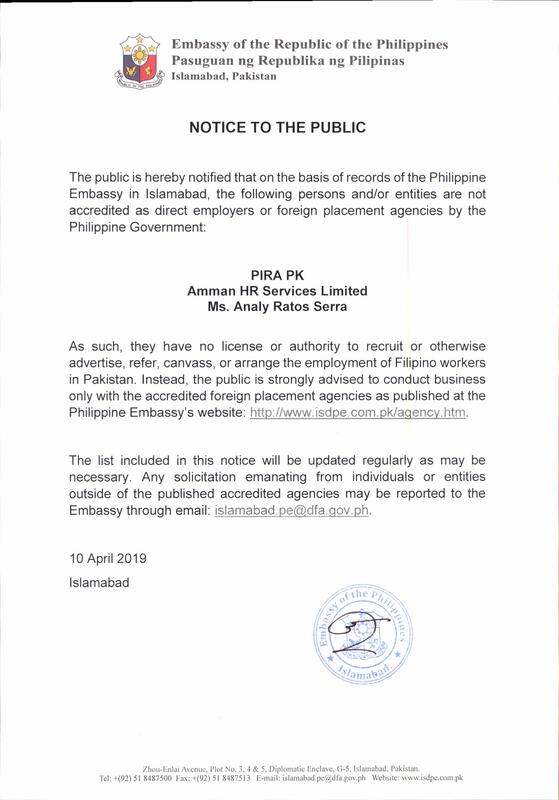 The Embassy strongly recommends that prospective and existing Filipino workers only deal with the abovementioned FPAs in the processing of their employment documentation to Pakistan. The Embassy reiterates that the ban on direct hiring per Section 123 of the POEA’s 2016 Revised Rules and Regulations on the Recruitment and Employment of OFWs is still in force. However, some exceptions, as per Section 124 of the said Rules, may be allowed by the Embassy, namely: (employers who are) a. members of the diplomatic corps; b. international organizations; and c. heads of state and government officials with the rank of at least deputy minister; and those who are exempted by DOLE and POEA under the Rules. The Embassy likewise reiterates that the processing fee for NOC, which is in fact a combination of three consular services namely: certification, verification and acknowledgement, remains at Rs. 10,500 or USD 75.00. Foreign placement agencies are not allowed to collect placement fees from the workers, as provided under the Rules. Applications for NOC may be submitted by the FPA on behalf of the worker, only upon the submission of a notarized Special Power of Attorney (SPA) executed by the worker for this purpose. The Embassy seeks your kind understanding and strong support in effectively carrying out its mandate to promote the welfare and ensure the protection of Filipino workers, wherever situated, as guided by existing laws and regulations. Any related queries, or report of violation of these Rules, may be conveyed to the Embassy through email at islamabad.pe@dfa.gov.ph or isdpe@isb.comsats.net.pk.